The lazy little dragon mumbled angry words to himself, being so tired of his masters impatience. There was an odd tone of urgency in his master’s voice now. This finally motivated him enough to rise from his bed to go see what the big commotion was, which was likely nothing much. Spike was now in such a hurry, that he was tripping up on his own scaly purple toes. Twilight was obviously in trouble, and the poor little dragon was having trouble keeping up with his own pace. As he fell down the stairs and looked up to see what was obviously attacking Twilight, she yelled. Spike groaned with a disgust of a manner that only a dragon would be capable of. “Twilight, I thought you were being attacked or something! Don’t scare me like that!” The dragon’s eyes began to grow large and teary. Spike was tired, but became intrigued by the mention of this spell nonetheless. “What’s that spell do, Twilight?” Spike asked, in the midst of cleaning up the scattered books around the library. Spike sat and thought for a moment, and then his brain began to hatch the best idea it’s had in a long time. Almost as good as wooing Rarity with his outstanding, manly moustache. Spike immediately assumed a very forlorn expression. “Oh, Spike, doggy eyes won’t do you any good! Now, please finish cleaning up. When you’re done, you can have the rest of the day off, seeing as I made you work almost all day yesterday.” The previously pouting spike suddenly transformed into an entire new creature. “Wow, thanks a bunch, Twilight!” The purple-green dragon began throwing the books into their shelves, obviously impatient to get out of Twilight’s door and into Rarity’s. “Huh?” The two companions chanted almost in synchronization, when they began hearing the odd noise. “Spike, stay here! I’m going to go see what that sound is.” Twilight obviously didn’t expect Spike to listen, and so they both head upstairs into Twilight’s bedroom (which was really just the second floor of the library) where the sound had appeared to be originating. They they both stood in sheer shock at the entrance to Twilight’s bedroom. This is because, beyond what either of the two could fathom a reason or explanation for, stood a towering blue box. Not only that, but there was a large creature, not unlike some of the primates she had seen roaming around Everfree, kicking at the box and streaming angry words that would make Fluttershy burst into tears. “Oh, um, hello, you.. two, pony and reptile thingies?” No response. Just a blank stare from the pony and the dragon. “Ugh, why are they keeping animals inside of a library? This place is lucky tha--” Twilight was shocked out of her shock (redundantly enough) by what she’d just been called. The alien standing before her spoke with an extreme tone of shock and awe. The intruder glanced over at Twilight, realizing that he had been rambling. Again. Twilight spoke. “Would you care to tell me just who you are?” Spike then decided to add his own two cents. Twilight shot him a sharp glare, prompting him to shut his mouth. “..Right, um, I suppose I should introduce myself.” At that moment, another creature very similar to the first stepped out of the blue box. However, this was was more feminine in form. The only thing Twilight could truly respond with, was another shocked stare. Meanwhile, Donna took the momentary silence to speak up herself. This only brought Twilight closer to a breaking point. Donna recoiled, obviously not expecting the colorful little pony to speak to her, much less in such a harsh tone. At the following sentence, The Doctor giggled. “Everypony. Everypony! That’s just brilliant! And I think I heard anypony before too, that’s brilliant.” The Doctor let a fit of laughter wave over him. Spike had fainted moments earlier, his young mind unable to process all of what was happening. “So, why are you two here?” Twilight inquired, while walking the couple downstairs to get them something to eat. “Oh, it’s just a disguise. I can’t just park a big spaceship anywhere, I might get a ticket. I don’t have any money! But hardly anybody notices a box. Just an.. unfortunate coincidence that I happened to land in your home, which is a library?” Twilight blushed at the mention of this fact. Donna scoffed. “I could say likewise, you’re a little odd yourself! If I--” The Doctor gave her a swift but light jab with his elbow before she could continue. This time, it was Twilight’s turn to scoff. At that very moment, The Doctor assumed a completely blank expression, and stared deep into Twilight’s eyes with his own. His own, that told a story. On a glance, he looked young, a ripe man who might’ve just complete college, and found the love of his life. But if you saw into his eyes, they told a different story. The story of an old being who had endured more pain and suffering than any one being should ever have to. His eyes told a beautiful tale, but not a fake one, one quite real indeed. One almost as old as Celestia herself. His eyes, and their heartbreaking expressiveness, even through a blank stare, spoke trillions of words to Twilight. At that moment, she had realized that this man, This.. Timelord, wouldn’t speak a word of falsity to her, as long as he was alive. She broke the gaze. The Doctor wasn’t particularly pleased about this. Twilight gave him a reassuring look, and continued. Donna was tired of having to wait, and began almost before Twilight could finish her sentence. The Doctor wasn’t particularly pleased with this, either. “Donna, these creatures seem to be peaceful enough, so I’ll take her word for it. Don’t be so quick to judge them!” The Doctor waved a playful hand towards Donna, and returned his sight to the purple pony. The Doctor spun around once he had finished, as if he had somewhere important to be. What he failed to realize, was that there was a wall directly behind him, relinquishing him of his walking duties once the two had collided. Twilight’s heart nearly leaped out of her throat when Rainbow Dash’s voice appeared right in front of her, while she wasn’t looking. Twilight tripped up over her own hooves, collapsing in a big heap. The speedster glanced confusedly at Twilight, looking to acquire a little more information. Twilight realized she had been a little over-dramatic about her presentation, and explained a little more thoroughly. Rainbow Dash’s expression was relieved of the confused wrinkles once things were clear. “Alright, I guess.” They began to trot towards the boutique. “So, uh, who’s the new two? Where are they from? Are they cool? Do either of them like to race? !” Rainbow Dash had put herself into an almost dream-like state in mere moments as she flew mindlessly beside Twilight. Twilight was prompted to snap her friend out of it. Which meant grounding her. With a fair bit of effort, Twilight pushed down on Rainbow Dash, causing her to flop on the ground. The rainbow maned pegasus ran back up beside Twilight with a small blush on her cheeks. The two walked the rest of the way in silence, and eventually found themselves at the door of their talented friends boutique. Knocking lightly on the door a few times, she heard a loud RRRRIIIIPPP emanate from inside of the boutique. Sweetie Belle could be heard hiccuping and sniffling, albeit muffled through the closed door of the boutique. Twilight and Rainbow Dash could only listen in awe, as the two inside the building had a very emotional moment with each other. They could then hear quiet clip-clopping of hooves heading towards the door. “Oh, I’m so sorry that you had to hear all of that, girls, I was just so shocked! I didn’t expect for her to cry, perhaps I’m a little too harsh on little Sweetie.” Rarity looked depressingly down at her feet. Twilight would not have this. Rarity finally caved, and began getting ready. Sweetie Belle looked forlorn for a moment, but cheered up almost instantaneously. Rainbow Dash stuffed a patch of grass into Pinkie Pie’s mouth, quieting her down. At this point, Pinkie had already chewed through and swallowed the grass. “Oh, Dash, quit being so silly! Of course she wants us all to come meet them together, because they’re probably really shy, I mean, after all, they are really new here, and they don’t wanna attract too much attention because then they’d have to hide, because they’re all shy and stuff, and so they would probably go all ‘oh no don’t look at me, I’m scared’ and that would be bad because...” At this point, the entire group had already tuned out Pinkie. Once she was going on like this, she wasn’t going to stop any time even remotely soon. Stopping in front of Fluttershy’s cottage, they rapped lightly on the door, knowing how timid she could be. Quietly and slowly, the meek pegasus opened the door and faced her friends. Fluttershy backed down, then stood back up, then backed down again, not completely sure of her own stance on the matter. One by one, all of the ponies were gathered together, and once the gang was assembled, they began to head back to the library. On their way back, Twilight couldn’t help but notice small oddities in some places. There were cracks in the walls of Sugarcube Corner where there hadn’t been before, and Twilight could’ve swore she heard a manner of voice in her head when they passed by it. Paying no regard to this, however, the whole group arrived back at the library. Rainbow Dash started babbling about it being really awesome. Applejack sat down and stared at the two creatures in front of her. For in front of the group of mares, The Doctor and Donna were in the process of opening a crack in the wall. A crack that wasn’t there before. A crack that looked like some kind of portal. When he had heard the soft clip-clopping of hooves behind him, and then reactions of shock and awe, The Doctor simply turned around, pointed at the rift, and spoke. “Doctor, what’ve you done? !” Twilight shrieked. Quickly, he pulled away the device which was emanating a unique buzzing sound away from the large rip, subsequently causing it to shrivel back down into a plain old crack in the wall. Visually, at least. Regaining her composure before the others, Twilight tried to speak. Donna started first. He gave her a look that screamed ‘Are you daft?’ before he spoke. “I told you. A rift, a fold where two areas of time and space weren’t supposed to meet.” He pulled out an odd biscuit, which Twilight couldn’t identity, before taking a bite. She spoke in a slow, hushed tone. The Doctor choked on these words, pieces of biscuit flying out of his mouth, before he spat the whole thing onto the ground. “Aww, what a waste of a perfectly good Jammie Dodger!” Chimed Pinkie Pie, which earned her a few strange looks from the surrounding ponies and Doctor. The Doctor’s eyes widened to the size of saucers. He wasn’t taking very well to this turn of events. He looked at the crack, then down at the ground again, a dumbfounded expression staying plastered onto his face. He pulled out another Jammie Dodger. Everypony and human and timelord in the room turned to look at Dash. “Rainbow Dash! Now is not the time to be placing blames, dear!” Rarity shot, but Rainbow Dash clearly didn’t care. “But just think about it! 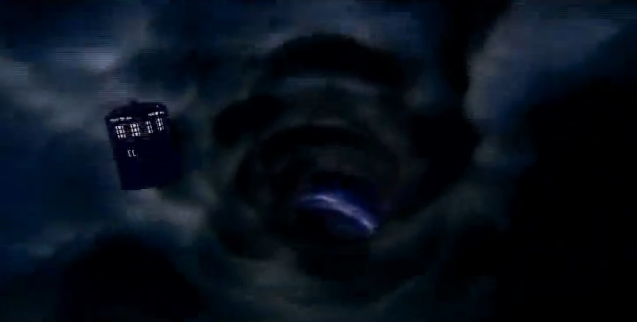 This weird alien thingy shows up, and at the same time, the big scary hole to Celestia knows where opens up! And you saw it with your own eyes, he was holding it open with that weirdo gizmo he had! How do we know that wasn’t some kind of crazy portal so he could lead his army of weird aliens here to invade!?? !” Everypony in the room looked at Rainbow Dash with wide eyes and open jaws, unsure of what to think, then back to The Doctor. “Um, I think that’s.. well, I mean, that sounds a little.. crazy,” squeaked Fluttershy, “so I don’t think that.. well, that’s probably.. wrong. After all, they do look... nice.” The Doctor smiled and clapped his hands together. “That’s right, I’m incredibly nice! I mean, I guess saving multiple intelligent species from extinction numerous times is pretty nice. But anyway, miss yellow pony, rainbow there has a good reason to be concerned. A strange man appears in an odd blue box, asks to stay, asks that nobody knows about him, then opens up a portal in our wall! Excellent deduction skills.” Rainbow Dash grinned smugly. “But you’re completely wrong.” Rainbow Dash’s face fell, giving The Doctor a forlorn look. “To tell the complete and honest truth, my race completely died out.. a long, long time ago. Even if I did want to invade, which I DON’T,” The Doctor gave Rainbow Dash a stern glare, “I couldn’t.” Twilight looked into his eyes again, and found sorrow with these words. He wasn’t lying. He was the last one left. But she didn’t quite understand; the other one he had with him looked similar, clearly a female of his species. ‘Or at least, they just look similar.’ she thought. She moved to give the Timelord a hug, her pony instincts to give a sorrowing soul some compassion kicking in. Before she could take a single step, though, The Doctor jumped up with an excited, bright look on his face. With a cheery tune to his voice that baffled the ponies yet again, he began. “Right, there are holes and cracks that shouldn’t be here! And I don’t like holes and cracks that shouldn’t be here, especially not the things that come out of them.” Rainbow Dash glanced over at Twilight with a disgusted expression on her face, and coming to terms with what Rainbow Dash was thinking, Twilight gasped and slapped her lightly. The other ponies in the group were all discussing quietly among themselves, thinking about what they should do. The Doctor looked patiently between all of them, waiting for them to come to a decision. Slowly, they ceased to talk, and an orange pony wearing a cowboy hat whispered in Twilights ear, and pushed the purple pony forward to speak. Twilight was troubled with this, because deep down, she knew that this Timelord couldn’t lie to her. She understood that he was genuinely distressed, but most other ponies couldn’t see one another like she could. None of them possessed the same magical prowess, so the only one who might agree with her would be Fluttershy... But that left four ponies out of six who didn’t sit well with the concept of helping a strange alien. Although a little agitated by how talkative the man was, Twilight could only nod her head. “Ponies, I think you should all stay at my library, so we can keep him company. I’m going to take a letter to Celestia! It’s impera.. Important, that the Princess is told right away.” She giggled to herself, remembering her assistant, Spike, and his tendency to get caught up on the ‘big’ words. “And don’t tell a soul about this! We can’t have a bunch of ponies swarming to meet aliens. Stay in the library.” Twilight trotted up the stairs to wake up Spike, leaving The Doctor and Donna alone with the five other ponies in the room. “I have the weirdest feeling..” Pinkie Pie said, “..It’s gonna be a long day. No, really! Flappy ears, twitchy tail, blinky eyes, hoppy feet! That means it’s gonna be a long day!” She smiled, happily explaining to her friends. My next fic is probably going to be a portal crossover, considering I’ve seen lots of pictures on the subject matter and yet no fics. If you know any portal fics, then please post the link in the comments; I’m incredibly eager to find out if anybody else has created one, it seems like it’d be fairly opportunistic.. lots to work with.